You know the intricate, elegant, classic pattern found on your grandma's doilies? Imagine that design as an item of clothing. That is laser-cut design. Laser cutting used to be reserved for haute couture designs. But as consumers began lusting for the technique, and the technology was made more readily available to manufacturers, it's become commonplace to see laser-cut silk and leather in ready-to-wear runway collections. Where the runway goes, affordable fashion typically follows: You can now find laser-cut clothing sold by fast fashion retailers like Topshop and ASOS. And that's just for starters. Laser cutting is a method of manufacturing that (surprise, surprise) uses a laser to cut materials. All of the advantages -– extreme accuracy, clean cuts and sealed fabric edges to prevent fraying -– make this method of design very popular in the fashion industry. Another benefit is that one method can be used to cut many different materials, like silk, nylon, leather, neoprene, polyester and cotton. Also, the cuts are made without any pressure on the fabric, meaning no part of the cutting process requires anything other than the laser to touch a garment. There are no unintended marks left on the fabric, which is particularly beneficial for delicate fabrics like silk and lace. 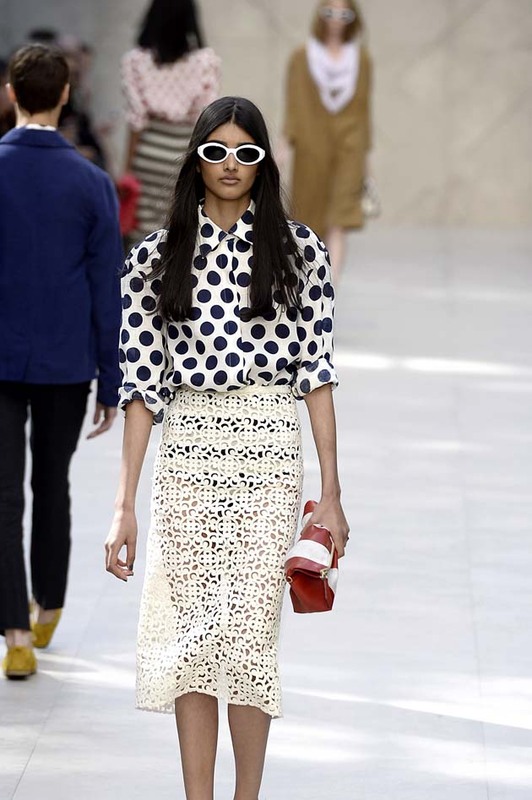 For example, Marc Jacobs used laser cutting to create delicate, ethereal lace and silk pieces for LV's Spring/Summer 2012 ready-to-wear collection (seen above). Similarly, Georgina Chapman and Keren Craig of Marchesa frequently send exquisite gowns down the runway with the most intricate laser-cut patterns. An example: the soft pink gown with layers and layers of laser cut fabric in Marchesa's Spring/Summer 2011 ready-to-wear collection. This is where things get technical. 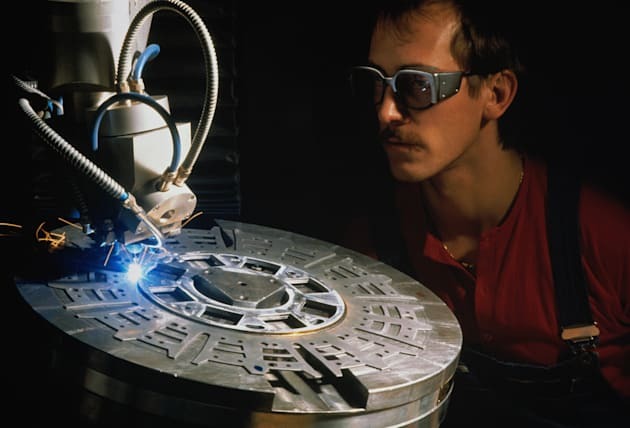 There are three main types of lasers used for laser cutting: the CO2 laser, the neodymium (Nd) laser and the neodymium yttrium-aluminum-garnet (Nd-YAG) laser. For the most part, the CO2 laser is the method of choice when it comes to cutting wearable fabrics. This particular process involves firing a high-energy laser that cuts by melting, burning or vaporizing material. To accomplish the precise cut, a laser travels through a tube-like device while being reflected by several mirrors. The beam eventually reaches a focal lens, which targets the laser to a single spot on the chosen material for cutting. Adjustments can be made to vary the amount of material that is cut by the laser. The CO2 laser, the Nd laser and the Nd-YAG laser all generate a concentrated beam of light. That said, differences in these types of lasers make each ideal for certain tasks. The CO2 laser is a gas laser that produces an infrared light. CO2 lasers are easily absorbed by organic material, making it the first choice when it comes to cutting fabrics like leather. Nd and Nd-YAG lasers, on the other hand, are solid-state lasers that rely on a crystal to create the light beam. These high-powered methods are well-suited for engraving, welding, cutting and drilling metals; not exactly haute couture. Because you appreciate attention to detail and precise cuts in fabric, you fashionista, you. Cutting fabric with a laser allows for extremely accurate cuts without ever touching the fabric, which means that a garment comes out as untainted by a manufacturing process as possible. Laser cutting offers the kind of precision that you'd get if a design were done by hand, but at a much faster pace, making it more practical and also allowing for lower price points. There's also the argument that designers who utilize this manufacturing method are less likely to be copied. Why? Well, the intricate designs are hard to reproduce in an exact way. Of course, those who copy can aim to recreate an original pattern or might be inspired by specific cuts, but utilizing laser cuts makes it that much harder for the competition to create an identical pattern. It's easy to forget, now that laser-cut designs are found all over, that the technology wasn't always as widely available as it is today. It used to be that the only way to get your hands on a laser-cut garment was to shell out a lot of cash; these days, you can get a laser-cut vest from Topshop for less than $100, and a faux-leather top from Forever 21 for under $30. Or, if you're more highbrow than fast fashion, not to worry -- you don't necessarily have to break the bank to get your hands on a laser-cut piece of clothing. Bloomingdale's, for example, has several offerings for under $300. There isn't a persuasive argument against this manufacturing technique. If you want beautiful, detailed clothing, laser cut is the way to go. There may be an argument in that you might not really care to have impeccably cut clothing. But then why did you read this far? It's only natural that you do! Cut Laser Cut and Laser Cut Fabric are two companies you can turn to if you'd like to start cutting your own designs, if you want to see what else laser cutting can do when it comes to fabric or if you feel the need to know more. And EDITD offers a deeper look at how the laser-cutting trend has grown from a technique used solely for haute couture collections to now something that is used by hundreds of brands -- from both ends of the cost spectrum and everything in-between.